Bedside Commodes, 3-in-1 Commodes, Drop-Arm Commodes. Commodes must, of course, be accessible to be usable. For those confined to a bed or wheelchair, it can be especially challenging when the need to answer nature's call arises. We've tried to accommodate that need with a comprehensive line of bedside commode, commode chair and other portable commode units. Unfortunately, toileting can be a difficult, complicated, even humiliating experience for some people. We have products that offer increased privacy and independence that are appropriate for home care and facility settings. Invacare 9630 All-In-One Gray Coated Steel Commode replacement parts. Replacement parts for commodes manufactured before April 15, 2013. Invacare 9630 All-In-One Gray Coated Steel Commode replacement parts. Replacement parts for commodes manufactured after April 15, 2013. Invacare 9630 All-In-One Commode has 350-lbs weight capacity. Fits over most commodes, includes pail and lid. 5-year warranty. Drive Medical Folding Commode Chair model 11148 has 350-lb weight capacity. Powder-coated steel frame comes with 7.5qt. commode pail. Drop Arm Commode from ProBasics has pushbutton drop arms for lateral transfers, white powder coated frame won't rust. Can be used as 3-in1 bedisde commode, or fits over a commode. Drive Medical 11125KD-1 Drop-Arm Commode has steel powder-coated frame with 300-lb weight capacity. Padded arms drop out of the way for easier transfers. 19.5" between arms, 24" overall width, 14" wide seat. Drive Medical 11125PSKD-1 Drop-Arm Commode has padded seat and 300-lb weight capacity. Powder-coated steel frame comes 12 qt. commode pail. Heavy Duty Commode with Extra-Wide Seat. 500-lb weight capacity, 23.5" between armrest. Includes pail, lid, and splash guard. Nova steel commode folds and unfolds in seconds. Chrome-plated 1" diameter steel frame. Waterfall armrests. Can be used as 3-in-1 bedside commode or fits over toilet. Bucket, lid & splash guard included. Heavy-Duty Drop-Arms, 500 lbs. capacity, extra-wide 23" seat and 25" between armrest. Includes pail, lid, and splash guard. Padded Raised Toilet Seat functions as Safety Frame, Bedside Commode, and Raised Toilet Seat with handles. Lightweight and 300-lb weight capacity. Lumex Steel Drop Arm Commode works as bedside commode, raised toilet seat, or toilet safety frame. Drop-Arm Commode has 300 lb. weight capacity. Drop Arm Commode from Nova Ortho-Med has padded drop arms for improved lateral transfers, white powder coated frame won't rust. Can be used as 3-in1 bedisde commode, or fits over a commode. Never clean a dirty pail again! Commode pail liners are much easier to use rather than cleaning dirty pails every time it's used. Liner is equipped with a super-absorbent pad which turns bodily waste (up to 17 oz) into a gel within seconds. Sold by case of 72. Versatile Pediatric Commode has small seat, adjustable height range fits most children. Steel frame, safety strap, easy to set to child's height. A must for patient rooms using a bedside commode. Mounted on caster wheels for easy movement. 3 sections are hinged for folding and adjusting to desired size. DMI 1213 Drop-Arm Steel Commode for improved lateral transfers. Drop-arm commode has 250-lb weight capacity. DMI Shower Transport Chair with 4" wheels has a 250-lb weight capacity, Padded vinyl toilet seat, waterproof back and seat, 1” rust and corrosion resistant aluminum tubing. Nova 8800 Deluxe Shower and Commode with Wheels has a 250-lb weight capacity, only 22.5" wide. Includes padded seat, locking casters, no footrest on this model. This Bariatric Drop Arm Commode has a 1000-lb weight capacity, 23" wide seat, adjustable height, includes pail and cover. Drop-Arms for easy transfers. Padded Drop-Arm Commode is designed for lateral transfers. Both arms drop with just a push of a button. Seat is 16.5" wide with 18" between arms. Full 300-lb weight capacity. Invacare All-In-One Aluminum Commode, 4ea. Buy in bulk and save! Carton or 4 units. Use as Bedside Commode or over the toilet safety frame. Lumex Imperial Bariatric Heavy-Duty 3 in 1 Commode has Drop-Arms and 600-lb weight capacity, extra wide 23" wide seat, adjustable height, comes with pail and cover. transfers. Cantilevered arms drop with just a push of a button. 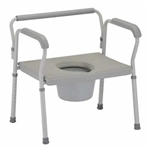 Heavy-duty 3 in 1 Commode has a 400-lb weight capacity, extra wide 23" wide seat, adjustable height, comes with pail and cover. Adjustable height Drop Arm Commode has 22.5" wide seat and 800 lbs. weight capacity. Fits over toilet or use as Bedside Commode. Extra-Wide Bariatric Bedside Commode has 24" between arms, Swing-away Arms are removable. Full 850-lbs weight capacity. Drive 11132 Bariatric Bedside Commode has 1000-lbs weight limit. Super heavy duty, extra large drop arm commode. Bariatric size three-in-one commode. 1000 lbs. Capacity and Extra-Wide 36" seat for Obese Bariatric users. Drop-Arms on both sides. Powder-coated steel frame. Heavy-Duty Bariatric Commode with Drop-Arms and Extra-Wide Seat. Nova 8583 has 500-lb weight capacity, 23" wide seat and 25" between armrest. Includes pail and lid. Bariatric Rolling Shower-Commode chair. Large seat area, 28" between arms, Swing-away Arms are removable. 750-lbs weight capacity. MultiChair 4020RX/4022RX Commode Shower Chair with self-propel wheels allows independence and convenience. Choose from 20" or 22" drive wheels, and they can be mounted on front or rear for chair, 300-lb weight capacity, padded commode seat, rust and corrosion resistant, rolls over any commode. We carry dozens of bedside toilet and rolling toilet chair models, including those with adjustable seat heights, drop arms and conveniently placed casters for easy mobility. Some feature dual functionality as portable commodes and shower chair combinations. You'll also find replacement parts for some of the most popular models as well as maintenance items like catch pails and pail liners. These pail liners are a must-have for those tasked with keeping things clean and tidy.